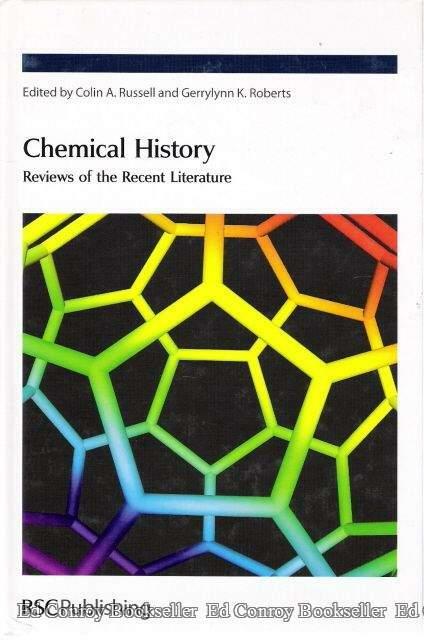 This book provides an historical overview of the recent developments in the history of diverse fields within chemistry. It follows on from Recent Developments in the History of Chemistry, a volume published in 1985. Covering chiefly the last 20 years, the primary aim of Chemical History: Reviews of the Recent Literature is to familiarise newcomers to the history of chemistry with some of the more important developments in the field. Starting with a general introduction and look at the early history of chemistry, subsequent chapters go on to investigate the traditional areas of chemistry (physical, organic, inorganic) alongside analytical chemistry, physical organic chemistry, medical chemistry and biochemistry, and instruments and apparatus. Topics such as industrial chemistry and chemistry in national contexts, whilst not featuring as separate chapters, are woven throughout the content. Each chapter is written by experts and is extensively referenced to the international chemical literature. Chemical History: Reviews of the Recent Literature is also ideal for chemists who wish to become familiar with historical aspects of their work. In addition, it will appeal to a wider audience interested in the history of chemistry, as it draws together historical materials that are widely scattered throughout the chemical literature. Established In 1987, we are an INDEPENDENT e-commerce SHOP with the flexibility of focusing on providing a quality product with personal service. With over 100,000 titles in our catalogue we Specialize in Higher level of Mathematics for Scientists and Engineers, Military History, History, Social and Political Sciences, Marxism, Communism, Russian Royalty (rare & hard to find), World War I and II, Military History, Vietnam War, Napoleonic Wars, Hollywood, Russia, Eastern Europe, University Press (Scholarly Texts). Price reflects 20% Off our regular price! QUESTIONS, please call us 518.279.9638, Mon-Fri 830am to 4pm ET. We ship 6 days a week, with most orders going out in 24 hours. We accept Checks, Postal Money Orders, PAYPAL, AmEx, Visa, MasterCard and Discover. International orders are shipped via AIR and should arrive in 7 to 10 days after shipping. Over sized items (e.g. Sets containing 2 or more volumes, table size, 4to, folios) and high cost items are sometimes subject to additional shipping charges; we will contact you if such is the case. Orders shipped outside of the United States may be subject to import taxes, customs duties and fees levied by the destination country. International shipments may be subject to such import taxes, customs duties and fees, which are levied once a shipment reaches the recipient's country. Additional charges for customs clearance must be borne by the recipient; we have no control over these charges and can't predict what they may be. Customs policies vary widely from country to country; you should contact your local customs office for more information. When customs clearance procedures are required, it can cause delays beyond our original delivery estimates.